Every live fantasy draft should have a Fantasy draft board. You can do it the old-fashioned way by physically creating one out of poster board and markers. You could also plunk down a little cash and get yourself some draft board software. If you want to go the bargain basement way, however, you can also create your own fantasy draft board using spreadsheet software like Google Sheets. Google Sheets in the spreadsheet application that is part of the software suite that is provided by Google as part of Google Drive. You may be most familiar with Google Docs, which is the word processing software part of the suite. The example I’ve put together here is a pretty basic draft board. It requires someone to manually enter the names, and any other info as desired. The advantage is it’s easy to set up and flexible. There are some really great draft spreadsheets that some others have created and shared that have some more advanced features. This Google Sheet draft board on Reddit updated in 2018, is pretty fantastic. Players are selected front a dropdown list and additional info is automatically added to the Google Sheets cell. It also has a duplicate pick detector built in. If that’s more what you are looking for, by all means, do a little searching on Google and see what you can find. 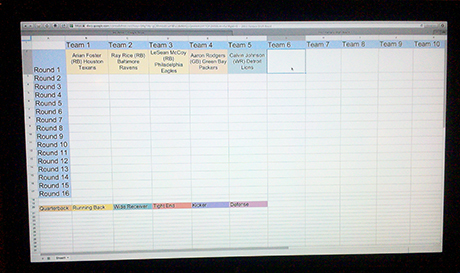 Otherwise, let’s take a look at how to make a basic fantasy draft board with Google Sheets. Why use Google Sheets? 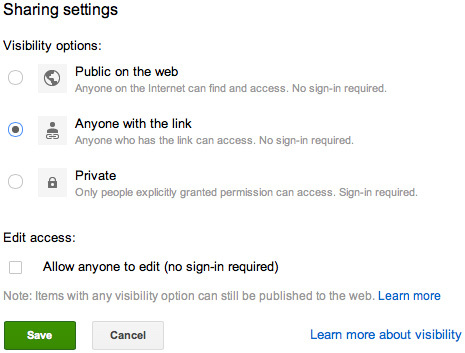 Files that are created on Google Drive are easy to share with others online. If one or more people can’t be at the live fantasy draft, they can view the Fantasy Draft board the same as you do at the draft. Or, if others at the draft want to pull up the draft board on their own laptops, tablets, or phones they can do that as well. If you won’t have Internet access in your draft room, or you just prefer not to use Google Drive, you can always use another spreadsheet application, or create the spreadsheet in Google Sheets and download it for use offline. I chose a pretty standard setup with draft rounds listed vertically along the left and Team names listed at the top of each column. A light blue background for the row and column headers makes them stick out a bit more. You can start out with any font and font-size in the beginning and then adjust later as you test the draft board out on the TV screen. Next, I choose color codes for each position and placed a key along the bottom for reference. Each time we type in a new draft pick, we will give it a background color corresponding with their position. If you are using a color-picker box like the one available in Google Drive spreadsheets, it’s a good idea to pick colors from the same row so you aren’t inadvertently selecting slightly different shades of green or yellow, or red, etc. Connecting your laptop or PC to your television or projector is pretty easy these days. A lot of computers have HDMI out ports. Whatever connection you have, you are likely to find the necessary adapter or cables at Amazon or some other electronics retailer. For Macbooks, you’ll have display port connections. Again, you can find a Display port to HDMI or DVI cables for about 10 bucks or so at Amazon.com. If you have a newer Macbook Pro running Mountain Lion (OS X 10.8) you could connect wirelessly via Apple TV. You could also use a Chromecast to connect to your TV. You’ll want to test your draft board ahead of time and tweak the font-size, column width, and any other characteristics so that the board displays properly on your TV. I ended up setting up my rows and columns with 24pt font and the cells where the draft picks go are set to 18pt. I then adjusted the columns so they fit nicely on my 55 inch screen. During or after the draft, you can share the document with others by choosing File > Share. You’ll have the option of keeping the document private and granting access only to those granted permission, or make it open to all and simply send the link to those that wish to access it. Constantly saving your doc is always a good idea, but documents on Google Sheets are also automatically saved by default, so in the event of a computer crash you won’t lose much, if anything. For any trades or other comments, you can make a note right in a specific cell (Insert > Comment) Or, just drop comments into a cell below the draft board. Of course, doing it this way you don’t have some of the built-in features that might come with a true fantasy draft board application that will make draft usage a little easier. If you are already familiar with using spreadsheets, however, this way is pretty quick and easy. Plus, it’s free.